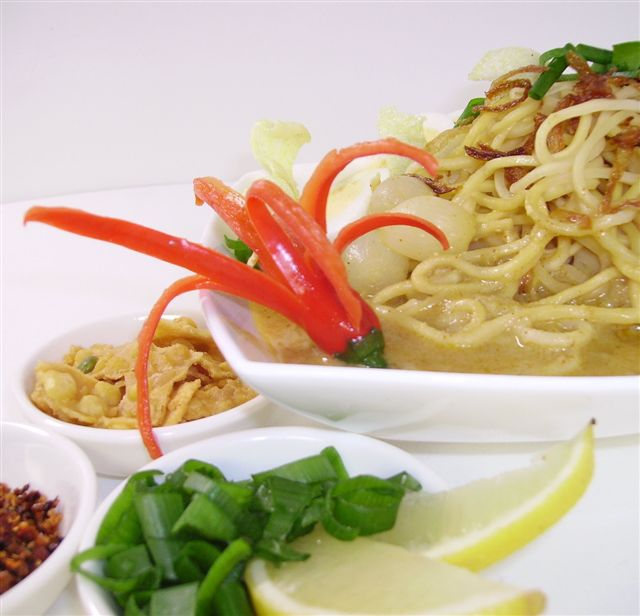 This is a very famous Burmese noodle dish served in a coconut milk curry, Who ever has tried it, has loved it. I learnt this out of my Burmese friend who is an expert at making it. * the soup should have a thick soup. 1/4 Spring onions, cut into thin circles. Add the started spices & fry for 2 min. Add chicken pieces & chicken cube stock & toss until all gets mixed. Pour the coconut milk & simmer for 10 min. bring to the boil & lower the heat. Cook for another 10 min then make a paste of chick pea flour & water & pour this in the soup & keep stirring so that no lumps are formed. Place all the accompaniments in individual bowls. Every one should help them selves by taking bowls, adding the noodles first then top it with the soup, then all the accompaniments one at a time & eat. Thanks Rabz it was lovely. I'm having it tonight. I'm going to try this one out on the weekend. I love noodles any type so I'm looking forward to have this.Hope it turns out nice. Thanx.